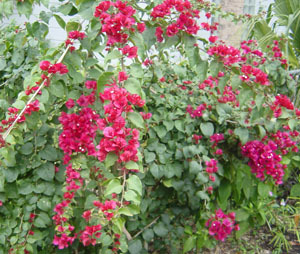 Bougainvillea is sometimes known as Paper Flower because of the bright colorful paper like bracts that house the tiny white cylindrical blooms. This plant grows as a vine, but it can also be trained to grow as a tree. The showy bracts come in many shades of bright reds, purples, hot pinks, orange or white. The intense colors are highly prized, with maximum blooms occurring in the winter. It blooms best in bright full sun. There is a version with variegated leaves. The vine has long sharp thorns, so be careful when pruning. This plant withstands severe pruning and drought, blooming best in dry conditions, except when getting established, but it is not salt tolerant. This well known plant was discovered by and named for French navigator Louis de Bougainville in Brazil.